How to View Android Text Messages on Computer (PC & Mac)? Where are text messages saved on an Android phone? Differ from the media files like video, music and photos which are saved on the SD memory card on an Android phone and can be transferred or viewed on computer directly. Text messages database are saved on mobile phone's internal flash memory, which can not be read on computer directly. If you want to view Android text messages on PC or Mac computer, we need to draw support from professional third-party software that can help us to extract text messages from Android mobile phone and save as readable file format on computer. Here in this article, we share different three ways to help you view Android SMS on PC or Mac computer. Coolmuster studio just launched its powerful software Coolmuster Android Assistant (for all Windows versions) or Coolmuster Android Assistant for Mac (OS X 10.10 or later), which can help to export text messages from Android devices to computer and save as .xml, .csv, .html or .txt files easily. It supports almost all Android brands, such as Samsung, HTC, Motorola, LG and so on. It also allows users to send and receive SMS via computer directly, and add, delete or edit contacts on computer. Let's take a look at its detailed user guide together. First of all, take a trail version of this Android managing tool with below buttons. Below is the step-by-step guide showing you how to use Coolmuster Android Assistant to export and view text messages on computer. The following pictures are captured from Windows version. If you are running a Mac computer, you can also refer to the guide as below because the operations are almost the same on both Mac machine and Windows PC. Connect your Android phone to the computer via a USB cord. Then, you will see the connected phone is detected by this program automatically. If it is the first time to run this software, you may be asked to follow steps to enable USB debugging on your phone at first. If your device can be detected by the program, you can directly skip to the next step. From the left side menu, you can see all the files in your cell phone will be displayed in categories. Click the "SMS" icon and you will enter the SMS managing window. All the text messages in your phone will show in list on the right. Mark the SMS you want to read on your computer and click the button of "Export". There will be a "Path" dialog appears after your click the "Export" button. Just choose an output location for saving the exported text messages and then click the "Ok" button to begin the transfer process. After a few while, all the selected text messages will be exported to your computer successfully. You will see all the text messages are saved in readable format and you can read them on the computer without any hassle. For more fantastic functions of the program, you can get it installed on your computer and try it out by yourself! 1. Launch Phone Transfer, connect your Android device and please be patient until your device is fully connected. 2. 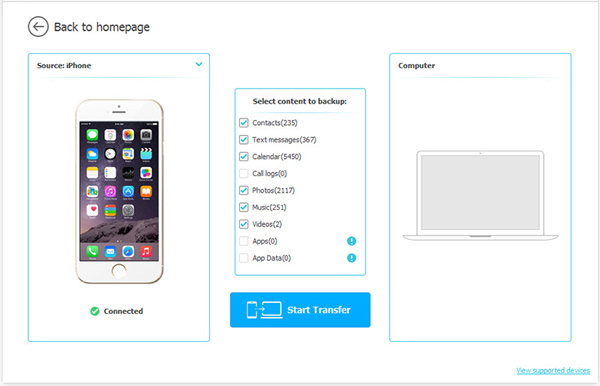 Choose "Backup Your Phone" option from the main interface. 3. Tick off "Text Messages" option from the listed content that can be transferred here. 4. Click "Start Transfer" button to copy those Android text messages on computer. 5. Now, you can read the exported Android messages on computer in HTML or TXT file format. Here is also a program helping you to export text messages from your Android phone to computer so that you can view them on computer with ease. It is Coolmuster Lab.Fone for Android (for all Windows versions) or Coolmuster Lab.Fone for Android (Mac), which is specially designed for Android users to recover lost and deleted text messages, as well as contacts, photos, videos, music, call logs and more from Android mobile phone and tablet with just several mouse clicks. Here is a detailed guide showing you how to recover deleted text messages from Android phone by using the Lab.Fone for Android. Both lost and existing SMSes can be detected by the program, so you can only choose the existing ones for exporting. 4. Preview and select the deleted text messages you want back and click the "Recover" button.